A musically talented racer (Elvis Presley) hoping to win enough money in Vegas to buy a motor for his car vies with an Italian count (Cesare Danova) for the affections of a beautiful pool manager (Ann-Margret). 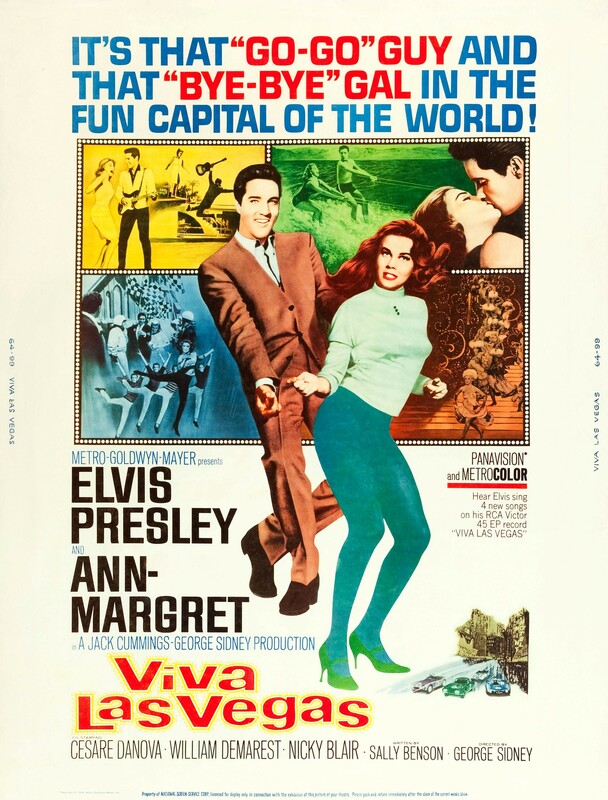 Elvis Presley met his real-life and cinematic match when he paired up with feisty Ann-Margret for this most enjoyable cult musical, directed with flair by George Sidney and featuring vivid sets and costumes, rousing song-and-dance numbers, nice use of Vegas locales, and a super-fun romantic rivalry (with plenty of genuine sparks flying). It’s hard to pick a favorite musical number, given that nearly all of them satisfy both musically and choreographically (and there’s a nice mix of on-stage and “narrative driving” songs). The title number, naturally, will stick in your head long after it’s done (just reading this review has likely placed it there…), but my personal picks would probably be “The Lady Loves Me” and “Appreciation”. The storyline — consisting of a love triangle, rivalry for musical dominance, and a car race — is appropriately fluffy yet relevant enough to ground the songs in a realistic context. As noted in the New York Times’ review, Viva Las Vegas “remains friendly, wholesome and pretty as all get-out”, and is certainly worth a film fanatic’s time. A once-must, for the chemistry between Presley and Ann-Margret. The script (by Sally Benson – who co-wrote ‘Shadow of a Doubt’ and worked on a number of other high-profile Hollywood flicks) is serviceable but still nonsensical; it’s really just an excuse to highlight what we know will happen in the first ten minutes: boy gets girl. Presley’s acting isn’t all that different from what he usually does in most of his flicks – he just seems to be having more fun. A-M’s big moment arrives when she dives into her somewhat-Marilyn Monroe turn with ‘Appreciation’ (she does sell that one and it’s a fun song). If you’re hanging out with your cult-film-fan friends, you will likely have a reasonable amount of fun. Personally, I think the film is a little too reined-in and could have been more fun had it been a little wackier, but EP and A-M make it worth a whirl.